It’s that time again…back to school and a brand new class of kindergartners! Did you know that Setting Goals with Students In Kindergarten is very important and research shows that student performance goes up when students have individualized goals?! Hey y’all!! I’m Emily, and I blog over at Carnes’ Corner! I love to share activities that I’m doing with my students and well as ideas that I just can’t get enough of…of course, I need to share real life stories, too! I teach at a charter school, and student-led goal setting is a HUGE requirement for us. Last year, I was super skeptical about how I would even make that happen with my kinders, but as the year went on, I realized it was totally possible, and it wasn’t nearly as difficult as I thought it was going to be. I wanted to share what I use and how I’m adapting it this year to make student-led goal setting a REAL thing in my classroom! Students are working on three goals at a time. These goals can be academic OR behavioral. For example, the first week of school, ALL students will are working on the same goals: “I can share with my friends”, “I can write my name”, and “I can work quietly”. This way, they can learn how to use their goal setting notebook, and we can incorporate those goals in to becoming successful students. 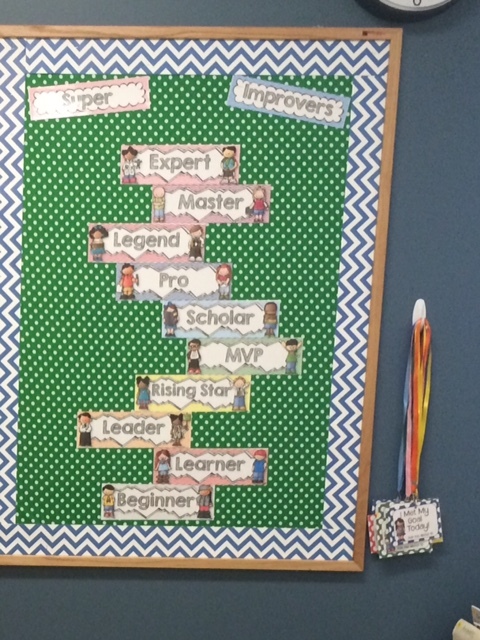 When the student accomplishes a goal, they can check it off in their spiral notebook, pick out a new goal with you, and wear a lanyard around the school for the rest of the day. This allows them the opportunity to brag on themselves! The students get SO EXCITED to wear their lanyards around the school. Our staff is really great about asking the students how they met their goal, and cheering them on as they meet a goal. I love it! I’ll be updating and sharing more photos as the year goes on, over at Carnes’ Corner. Make sure you stop by, and let me know how YOU use student goal setting in your classroom! Thank you Emily for the awesome guest post! Find all of her amazing products at her TPT store, Carnes’ Corner! Yes, each child has their own spiral notebook, to keep track of their own personal goals. Where do students store the goals they have not selected yet? Will there be more goals added?